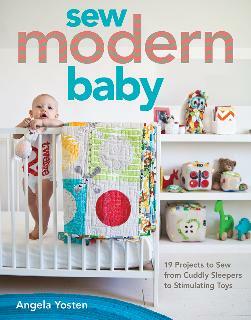 Sew Modern Baby by Angela Yosten. Features 19 Projects from Cuddly Sleepers and Toys to a pattern for a multisensory activity gym!Includes paper templates for applique. A great book to have with today's modern style!!! Sew Modern Baby by Angela Yosten. Features 19 Projects from Cuddly Sleepers and Toys to a pattern for a multisensory activity gym! A great book to have with today's modern style!! !